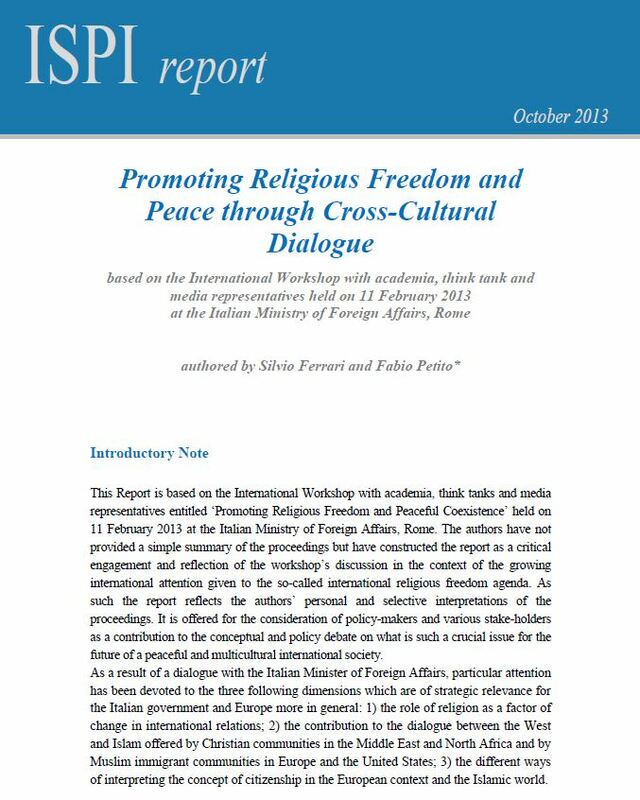 This Report is based on the International Workshop with academia, think tanks and media representatives entitled ‘Promoting Religious Freedom and Peaceful Coexistence’ held on 11 February 2013 at the Italian Ministry of Foreign Affairs, Rome. The authors have not provided a simple summary of the proceedings but have constructed the report as a critical engagement and reflection of the workshop’s discussion in the context of the growing international attention given to the so-called international religious freedom agenda. As such the report reflects the authors’ personal and selective interpretations of the proceedings. It is offered for the consideration of policy-makers and various stake-holders as a contribution to the conceptual and policy debate on what is such a crucial issue for the future of a peaceful and multicultural international society. As a result of a dialogue with the Italian Minister of Foreign Affairs, particular attention has been devoted to the three following dimensions which are of strategic relevance for the Italian government and Europe more in general: 1) the role of religion as a factor of change in international relations; 2) the contribution to the dialogue between the West and Islam offered by Christian communities in the Middle East and North Africa and by Muslim immigrant communities in Europe and the United States; 3) the different ways of interpreting the concept of citizenship in the European context and the Islamic world.